What is this thing? It's on the driver's side B pillar. 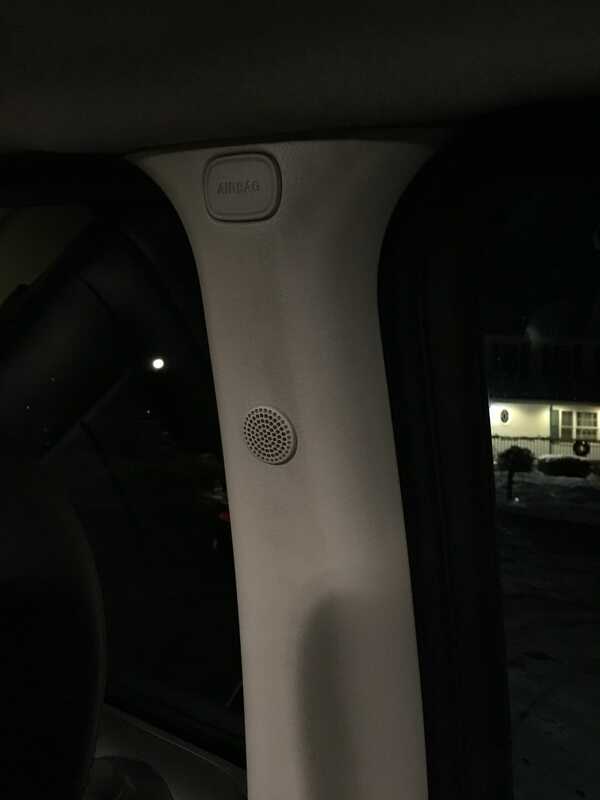 It looks like a little speaker for the onstar or something. Or maybe a temperature sensor? But whatever it is, lately when I get in my car, before I put the key in the ignition, this thing is making all kinds of odd noises. My battery has also been pretty week. I hope this thing isn't malfunctioning and drawing power all night? Also it's been -5 to 10°, today is the first day in a week that its been above 10°. So maybe my battery is just weak from the cold. But still, some odd noises come from this spot. That is the interior temp sensor for the auto-HVAC. It's basically a small squirrel case and motor with the sensor in the middle. If it's making noises, probably the motor is dying. You could try oiling it. On my '02, it would screech when it got really cold but stop after a while. Why would it start making noises before the truck is started? I unlock it with the remote, open the door, and it's already screaming away. To get a sample of the interior temps before the HVAC starts working. That's what I think anyway. +1 with @Mooseman on this. I actually changed mine out some time last yr. I did try some oil but the noise came back a few weeks later. I think I ordered the part on Amazon I'll link it to this shortly. Probably about 30-40 bucks. How easy is it to get in there? It has only been making sounds when it's below 10°, so I probably won't bother unless the sounds stuck around once it actually gets above freezing again. Do you have an actual link to the part, not just a screen shot? ALSO, here's my sensor warning me that rebel scum are attacking. Its funnier if you hear more of it but by the time I got my phone out, that was all it did before it stopped. How easy is it to get in there? I'm bringing this thread back. I am getting a buzzing noiser from this part, very intermittent. But, when I slap the box between the driver seat and passenger seat, the noise stops. It may come on again after a few minutes or maybe a few days. But, always, slapping that little box stops it. Weird, huh? Same thing on my old Tahoe. Slap the pillar, noise would go away for a day, weeks, or months. No Rhyme or Reason to it. Bearing inside the little cage fan motor is dying. Maybe a bit of oil might help. Mine still makes noise too, only when it's cold. Some day I'll get around to replacing it. Maybe. I might be missing something, but your description sounds like you're striking the console between the front seats. There is a fan in the base of the console for rear HVAC. The bearing in the motor may be going out. Just turn it off. If you want to replace that - you'll have to remove most of the console if I'm not mistaken. It's kind of a PITA. Otherwise - if you mean the little "speaker" looking thing in the "B" pillar, remove the pillar cover. It's just held in by clips. I don't recall if the sensor is in the panel, or in the pillar itself - either way mine came right out and I was able to clean it. I used compressed air to blow off the thick black coating of dust & grime. I believe I then sprayed it out with electronics cleaner, dried it, and oiled the bearing with some spray oil (WD40 most likely - although I don't recommend WD40 for "sleave" bearings anymore). This was over 7 years ago and the only noise I ever get out of it is a light "fan" like noise just like it made from the factory. I think the noise is mostly due to the inbalance created by all the gunk and the gunk slowing it down and causing it to chatter. I could be wrong about the cause, though. I have a question about this sensor. Is this the ONLY cabin temperature sensor? I have another problem, aside from the sound when its below 30°. I'm not sure if it's normal, or if it's something wrong with this sensor (or another sensor) that can be fixed by replacing it. But on sunny days, its very hard to get my heat on. No matter the temperature. For example, today the daytime high was about 25°, but with tons of bright March sun. I had to crank the heat all the way to 80° to get it to stop blowing cold air at me. It's kind of the behavior you might expect if the fan wasn't spinning at all. But the fact that it makes this noise when it's cold strongly suggests it is working. My truck is a dark color, maybe these fans just aren't strong enough to compensate for how warm it gets inside the panels when the sun is shining? The auto HVAC has a sun load sensor so maybe it thinks the sun is warm enough? Or the sensor is not working right. Putting it to max temp overrides any auto function. The problem is putting the heat on 70° on a cold sunny day causes cold air to blow on my when it's already like 40° inside the cabin. Tell me more about this sun load sensor, maybe that's whats bad? I think it's more for the A/C. Does something to determine how much A/C to put out. I don't even think it's used for heat. I've never had an issue with either the TB or the Saab with their auto HVAC. Do you set it to blow to the floor and/or defrost or the dash vents? In the Winter, I keep everything on Auto and the temp around 70ish. So the heat will usually be floor and windshield. Problem is when the sun is out, the car thinks its hot in the cabin when its not, so it goes into "cooling" mode so it starts blowing cold air out the vents, all automatically. I rarely use the full auto mode. If you set it to floor/defrost and set it to 70, it will still keep the temp auto. Just don't touch the fan setting. Having defrost on makes it think it is cold. In winter, I always have it to floor/defrost. Never a problem. Consider the possibility that the actuators in the ducts have moved on the shafts they're connected to. The HVAC controller could be commanding heat, but if the actuator is not indexed on the door correctly the result would be wrong. The automatic HVAC has temperature sensors in the ducts to create a complete feedback loop, but if the actuator and the door are not indexed it can't do its job. This seems unlikely since my issues only happens when the truck is in strong, direct sunlight. At night, auto temp works fairly accurately. It very well may be the sun load sensor input causing the controller to attempt to "cool" the occupant. The "B" pillar cabin temp sensor at worst would be slow to react to cabin air temperature changes if it's filthy. If it's outright BAD, I don't know what it would do. When my cabin air temp sensor was crudded up I would get cold air no matter what I did if the car was hot to start with and hot air if the car was cold to start with. I'd give it a good cleaning - also clean the holes in the "B" pillar that it draws air through. Mine were completely blocked if I remember correctly. That would basically trap air in the "B" pillar with no way to pull cabin air over the temp sensor. I doubt that your cabin air temp sensor is getting heated up to the point that it's trying to cool you to compensate for the heat built up in the pillar - but you never know. It's worth a shot. For those that want to know just put the front seat as far forward as possible and pull on the trim. I think you are right about this. I turned off the switch for that fan and the noise hasn't returned. Thanks. I replaced mine tonight. Wasn't quite as easy as I expected. You have to pry off the "ABS" decal to access a screw to remove the top piece. And the ribber gasket all the way around is a real pain. I did replace mine though, hopefully this gets ride of the super cold weather noise (i'm sure it will) and also gives me a more accurate cabin temp on cold, sunny days (i hope it will). One problem I had was getting it all back together. Everything looks like it's in the right place, but it doesn't seem to fit as snug as it did before I pulled it off. It's almost as if something isn't snapped into it's snap correctly. But i've very firmly pushed and wiggled all around the panel so I dunno. Check where the pillar meets the rubber door gasket. I've had issues with mine - mostly in the back, but I'm sure it could be an issue anywhere. lol I'm glad I'm not the only person guilty of just trying to slap a problem away. So far, no more noise with the new fan (though we haven't had any 15° days since installing). And we have had some cold but very sunny days and the heat does come on a little better now too.